IR Film Review: Supernerd Gets Stranded With ‘The Martian’ and Loves Every Second of It! Have you ever had your car break down in an unfamiliar area? It has to be the worst feeling ever, the wave of hopelessness and being trapped are inescapable. In that situation, no matter where you are, you know civilization (and a tow truck) are usually not too far off. But what if it wasn’t? What if help was millions of miles away? What if you were stuck with a finite supply of food? Water? Oxygen? What if you knew you might die alone, never getting to see another face or hear another voice for whatever short time you have left in this life? 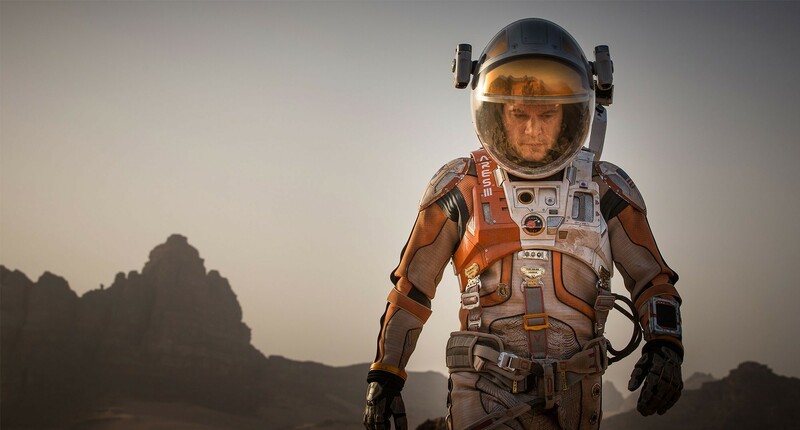 That is the circumstance that director Ridley Scott gives us in his newest sci-fi epic The Martian. But don’t think that the acclaimed filmmaker is bringing us a story of hopelessness and futility. This is a film that puts on the forefront the undying will of the human condition to survive in even the most impossible of situations. We start with the crew of the Ares III, a manned scientific mission to Mars smack dab in the middle of their current stay on the red planet, when they get a warning from NASA about an impending dust storm. This is no ordinary storm though; this dust-up has the potential to put the whole mission at risk. So the mission commander calls for an immediate evacuation of the planet and everyone gets off-planet except for botanist Mark Watney (Matt Damon), who is impaled by a satellite antenna and is presumed dead. But Watney isn’t dead. The hit knocked out his suit’s bio-readings and the crew had no idea that a metal rod from the antenna and his blood formed a makeshift seal in the hole in his suit, saving his life and giving him a second chance at survival. Now Watney needs to figure out a plan for survival, knowing that another mission is slated to come back in a few years. The engineers at NASA figure out that he’s alive though and soon everyone is on the clock to figure out a way to not only help Mark survive but bring him home safely. radiates from astronaut Mark Watney. Screenwriter Drew Goddard, who at one point showed interest in directing before turning the reins over to Scott, has delivered one of the most faithful book-to-film adaptations that I’ve seen since Gillian Flynn wrote the screenplay for her novel Gone Girl. I’ve read the book by Andy Weir, and after watching the film I can honestly say it was like watching the pages come to life on the big screen. Of course there had to be sections excised for the sake of pacing and overall storytelling, but Goddard managed to find the right balance and keep the film moving along at a brisk pace. I’m going to go ahead and say if he isn’t nominated for an Oscar for Best Adapted Screenplay it will be a crime. The Martian is anchored by a powerhouse performance from Matt Damon. Having no one to really work against and having to carry his third of the film by himself, Damon shows why he’s in a class all his own. The actor makes Mark Watney the personification of hope, a walking, talking cute kitten “Hang In There” poster. But not once did it seem sappy or cloying. Whether it’s declaring himself a space pirate or lamenting the lack of choices in the music available to him (one crew member loves their disco), Watney will not let Mars get him down. And the supporting cast is stellar beyond belief. While not everyone had a “moment” everyone brought their A-game. 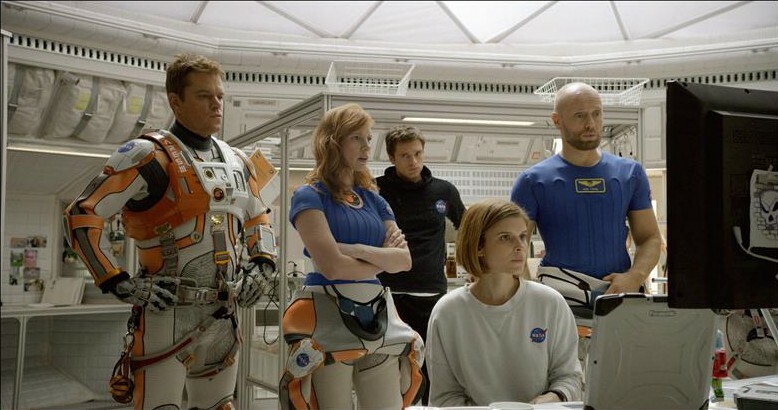 Jeff Daniels, Kristen Wiig, Sean Bean and Chiwetel Ejiofor held their ground as the NASA team trying to keep Mark alive from millions of miles (and a 12 to 24 minute conversation delay) away. Meanwhile Kate Mara, Sebastian Stan, Michael Pena, Aksel Hennie and especially Jessica Chastain worked equally as hard with not only the fact that they left a man behind but with the decisions that could cost them their careers and possibly their lives. With a soundtrack of 70’s hits that make this movie more fun that it has any right to be, The Martian takes the Robinson Crusoe tale to new heights (and planets). Beautifully shot and chock full of superb performances, this is one space tale that goes above and beyond to entertain and achieves its goal with interstellar ease.